Blur 21 Box Set Out Now, Win Blur’s Entire Catalog on Remastered CD & Vinyl! 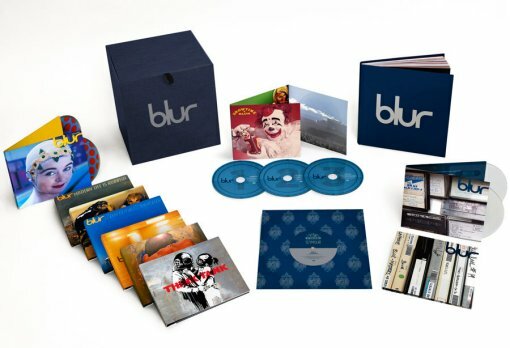 Win The Entire Blur Catalog on CD & Vinyl! Hey folks, it’s been 21 years since the release of Leisure, and due to popular demand, Britpop legends Blur have unleashed a brand new high fidelity, gorgeously packaged, and massively comprehensive (18CD/3DVD) box set, entitled Blur 21. All seven studio albums are collected with over 5 1/2 hours of unreleased material including 65 previously unreleased tracks and more than twice as many rarities, 3 DVDs, a collector’s edition book featuring rare and unseen photos and a new and exclusive interview with the band, and a special limited edition 7-inch vinyl featuring a track recorded under the band’s original name, Seymour. The box will also include a digital download code for the albums and all bonus material. The collection – which sees the first 5 albums re-mastered by Frank Arkwright in Abbey Road Studios – has been fully overseen by Graham Coxon and producer Stephen Street. Sounds awesome right? Well, as Austin Powers might say, in order to mark the occasion of the occasion of the release of the Blur 21 box set, I’m giving away Blur’s entire remastered catalog in CD and vinyl format. These are the same Frank Arkwright discs that make up the Blur 21 box set, but just not in the fancy blue box and without the DVDs. If you’d like to win this killer prize, head on over to www.bumpershine.com/blur and toss your hat in the ring. Contest ends Aug 31, 2012 at 11:59 PM ET, US residents only, 1 entry per person. Don’t forget, if you spread the word via Facebook and Twitter and you’ll get some sweet bonus entries. In other related news, Blur’s recent Parklive set (Aug 12, 2012) from Hyde Park in London is now available on iTunes. CD and deluxe versions will follow and can be pre-ordered here. Full Blur 21 press release and video trailer from Blur @ The 100 Club London after the jump. 21 years since the release of their debut album Leisure in 1991 and due to popular demand, Blur’s body of work has been personally compiled by the band and gathered together in one box, due for release by Parlophone on 30th July 2012 (31st July in North America). All seven studio albums are collected with over 5½ hours of unreleased material including 65 previously unreleased tracks and more than twice as many rarities, 3 DVDs, a collector’s edition book featuring rare and unseen photos and a new and exclusive interview with the band, and a special limited edition 7-inch vinyl featuring a track recorded under the band’s original name, Seymour. The box will also include a digital download code for the albums and all bonus material. Highlights of the box include early versions of tracks recorded for Leisure, bare bones early demos of the classic singles ‘For Tomorrow’ and ‘Beetlebum’, previously unheard songs ‘Saturday Morning’ and ‘Hope You Find Your Suburbs’ and never released sessions with Bill Laswell and the legendary session with XTC’s Andy Partridge. Other rarities are ‘Don’t Bomb When You’re The Bomb’, ‘The Wassailling Song’ and ‘Fools Day’ which appear on CD for the first time. DVD material includes Live at Alexandra Palace 1994 and Live at Wembley ‘The Singles Night’ 1999. In addition to the 21-disc Deluxe Box Set, all 7 studio albums will be available individually, each with a second disc of b-sides, previously hard-to-find tracks and exclusive bonus material. A vinyl box set will also be available, with six of the seven albums on double-vinyl, highlighting iconic artwork and visuals from Banksy, David Shrigley and Graham Coxon among others. The vinyl box set will include a download code to access all of the bonus material digitally. Each of the 7 LPs will also be available separately on heavyweight vinyl. Blur’s 7 studio albums are: Leisure (1991), Modern Life Is Rubbish (1993), Parklife (1994), The Great Escape (1995), Blur (1997), 13 (1999) and Think Tank (2003). Next Post CMJ 2012 Lineup To Be Announced Tonight! The contest link is returning a 404 error!